This Lease Agreement (the "Lease") is entered into as of , 20___, between __________________________ ("Landlord"), and __________________ ("Tenant"). Landlord hereby agrees to lease the Premises (hereinafter defined) to Tenant, and Tenant hereby agrees to lease the Premises from Landlord, upon and subject to the terms and conditions set forth in this Lease. The premises covered by this Lease (the "Premises") consist of the entire building located at ________________ (the "Building"), together with all associated parking facilities, driveways, and grounds and together with all easements, covenants and rights appurtenant thereto. 3.1 Lease Term. The term of this Lease (the "Lease Term") shall be the Initial Term and any Renewal Terms, as described in Sections 3.2 and 3.3 below. 3.2 Initial Term. The initial term of this Lease (the "Initial Term") shall commence on (the "Commencement Date") and shall end on the tenth anniversary of the Commencement Date. 3.3 Renewal Term. Provided Tenant is not then in default under this Lease, Tenant shall have the right to extend the Initial Term of this Lease for up to two periods of five years each (each a "Renewal Term"). This option shall be exercised, if at all, by written notice given to Landlord at least one-hundred eighty days before the last day of the Initial Term, or, if applicable, at least one-hundred eighty days before the last day of the first Renewal Term. 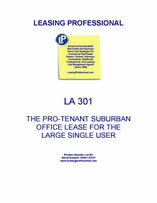 All of the terms and conditions of this Lease shall continue in full force and effect during any Renewal Term, except that the amount of the Base Rent shall be increased (and in no event decreased) at the beginning of each Renewal Term to the "Prevailing Rate" (which for purposes of this Lease shall mean the fair market rental rate then being charged to similar tenants for like space similarly situated in comparable office buildings in the _________________________ area). If requested in writing made no earlier than two-hundred forty days before the expiration of the then current term or the first Renewal Term, Landlord shall give to Tenant a written quote of the Prevailing Rate that will be binding on Landlord and that will be applicable to the initial Renewal Term or second Renewal Term if Tenant exercises its option. The written quote shall be provided within fifteen days after receipt of the request. Tenant accepts the condition of the Premises "AS IS", and Landlord shall have no responsibility whatsoever for constructing, altering, improving, or restoring the Premises except as provided in Articles 9 and 10. Tenant may use the Premises for office purposes and for such other purposes as may be permitted by applicable law.